The first of five 2013-dated strikes to be issued as part of a series of five ounce silver collectible coins is the 2013 White Mountain Silver Uncirculated Coin. A design on the reverse of the strike is emblematic of White Mountain National Forest located in the state of New Hampshire. This coin is offered by the United States Mint as the sixteenth release of its America the Beautiful Five Ounce Silver Uncirculated Coin™ series. Strikes of the series feature reverse designs emblematic of different sites of national interest from around the United States and its territories. These same designs are also featured on two other series of strikes from the US Mint - the America the Beautiful Quarters® Program and the America the Beautiful Bullion Coins. The original designs for all three programs are created initially for the related quarters. However, these silver uncirculated coins more closely resemble the bullion coins because they are also struck from five ounces of .999 fine silver like these uncirculated pieces. White Mountain National Forest was initially established in 1918 and today consists of almost 800,000 acres. A majority of that area is found in New Hampshire but a small portion resides in the neighboring state of Maine. Like all America the Beautiful related coinage, the obverse of this strike contains a portrait of George Washington, the first President of the United States. The portrait was originally created by John Flanagan and has been featured (with minor variations) on circulating quarter dollars since 1932. Obverse inscriptions include UNITED STATES OF AMERICA, LIBERTY, IN GOD WE TRUST and QUARTER DOLLAR. A 'P' mintmark may also be found on the obverse indicating it was struck at the US Mint's facility in Philadelphia. For identification purposes, the related bullion coin is also struck in Philadelphia but contains no mintmark. 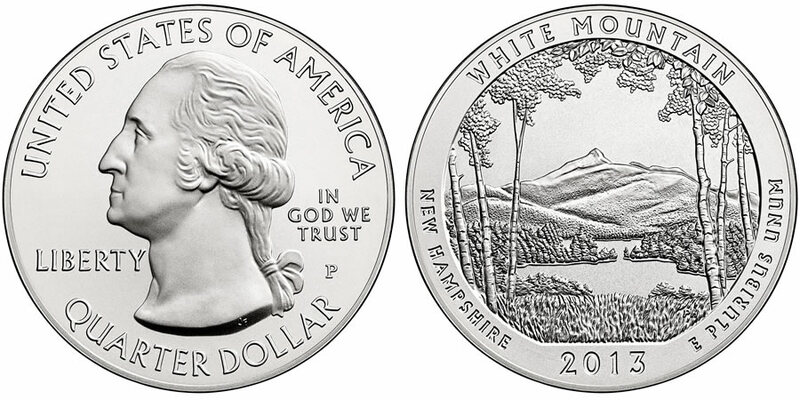 A design emblematic of White Mountain National Forest is found on the reverse of the coin. Reverse inscriptions include WHITE MOUNTAIN, NEW HAMPSHIRE, 2013 and E PLURIBUS UNUM.